Polish border guards conducting a check in a train heading from Moscow to Nice were astonished when they opened one of the suitcases, only to find a 30-year-old Russian woman inside. The woman and her sexagenarian husband have been sent back. "Foreigners adopt every means imaginable to cross the border, but this is the first time I am dealing with a person hidden inside a suitcase," Dariusz Sienicki, a spokesman for the border service, told the media on Monday. 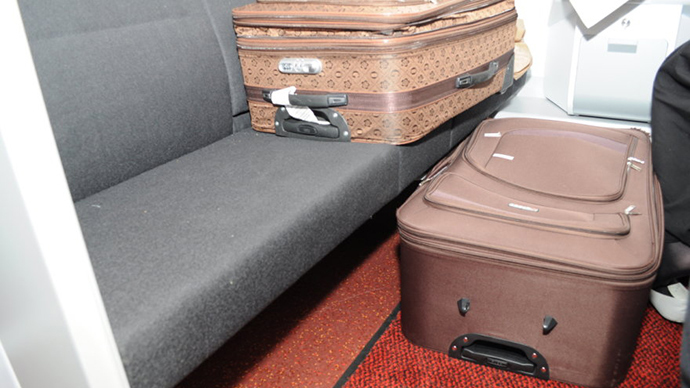 The border guards in Terespol, on the border with Belarus were alarmed by a suspiciously large suitcase in the coupe of one of the passengers. And their fears did not prove unfounded. “’Hi, and this is my wife,’” the Frenchman said when officers opened the luggage. “The woman in the suitcase was feeling well and did not require medical attention,” said Sienicki. The police said that approximately 100 people a year try to sneak in through the border, and that those caught face a punishment of up to three years in jail. But on this occasion, the service decided not to prosecute the couple, and sent them back to Russia. Ironically, as the spouse of a French citizen, the Russian woman was entitled to apply for a Schengen visa. “If she was just sitting next to him, instead of in a suitcase, she would have been fine,” Sienicki said.